This video of me was taken in Bastogne, Belgium in December 2016 at the Battle of the Bulge anniversary weekend. I was interviewed by Ross Owen for his show and he kindly edited this for me. I talk about my DDay tours in Normandy. I spent a lot of time creating this website and have packed it with information. You don't have to read it all, but I believe that discerning professionals deserve to know about the person they are considering hiring. I was born and raised in Colchester, one of England's oldest and most historic towns. In the 1st Century, Colchester (Camulodunum) was an important Roman city and garrison and to this day is home to several British Army barracks. Colchester lies in the north of the county of Essex, close to Suffolk and in the area of many WWII American 8th Airforce sites. I attended the Colchester Royal Grammar School, founded in 1206 and given its Royal charter by Henry VIII. I have been a regular visitor to the D-Day beaches and battlefields since the 1980s, having been told accounts of the invasion by my Great Uncle Cyril Rand who landed on Sword Beach on D-Day as an officer in the Royal Ulster Rifles. ​I had other family members who served in WWII, all of whom told me stories, and in many ways these shaped my childhood. Also as small boy in 1970s England as my generation did, I played with plastic Airfix Spitfire planes, Dinky Churchill tanks and read WWII comics like Commando, Battle and Warlord. WWII has always been a huge part of my life. Prior to moving to Normandy in 2001, I was involved in WWII history in other ways. For 20 years I was a WWII re-enactor and living historian and travelled to and organised events all over England, France and the Netherlands. I was also the owner of two WWII military vehicles, a British Morris C8 cargo truck and with my father an American Scout Car. Since I became established in Normandy, I have been lucky enough to become internationally regarded as both a battlefield guide, and also as a "friend of the WWII veterans." Although not qualified in terms of academic achievements, people seem to appreciate my passion and enthusiasm for showing people the historic sites. This has made me the "go to guy" for many organisations and fellow historians around the world. I am grateful for the thanks and acknowledgement I receive in books by many leading historians including: Storm of War by Andrew Roberts, In the Footsteps of the Band of Brothers by Larry Alexander, Dog Company: The Boys of Pointe du Hoc by Patrick K O'Donnell, Breakout from Juno by Mark Zuehlke and many others. For information about my work as a Historical Advisor and consultant on TV and Film projects, I invite you to visit the specific pages. 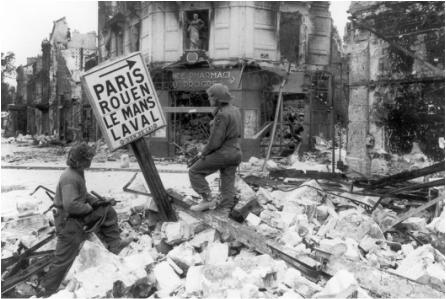 In addition to guiding, I try and find time to continue working on my Normandy Combat Chronicles series of books. All of which will be intimate studies of some of the smaller campaigns and incidents that occurred in Normandy. This is because it is the small-scale actions that have always especially fascinated me, the sometimes brief fire-fights between dozens of participants in a small field, rather than the Corps and Army sized operations. My first book Angels of Mercy was published in April 2013 and I am hoping to complete the second in 2017. I also wrote a chapter for "Guardians of Remembrance: managing and interpreting "D-Day's sites of memory" by Geoffrey Bird, which was published in 2016. Right - is one of the web shorts I filmed for DDay in HD for The History Channel. I featured as a talking head in their two DDay shows in June 2014. This was a big production and I was humbled and honoured to take part. I worked on a couple of other off-screen TV projects in 2015 and 2016 including a British show about tracing people's relatives. The big change to my career is the launch of WW2 TV, my subscription based channel/website. I hope you will visit my sister site and check out what I am doing.